The Hostal Patria invites you to discover the Spanish capital’s culinary culture. Here are some outstanding tapas bars, restaurants and gourmet markets, all within a ten-minute walk from our hostel. The San Miguel Market is located in the Plaza de San Miguel, right next to the Plaza Mayor. It is a privately-owned gourmet market whose most outstanding architectural feature is the conservation of the original cast-iron structure, dating from the early 20th century. This well-known restaurant, bar and cafeteria specializes in hams and cold meats, many of which can be vacuum-packed for traveling. 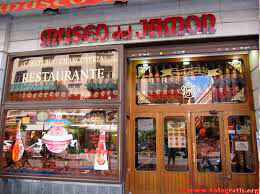 An internationally renowned establishment, the Museo del Jamon (the Ham Museum)) is located right across the street from the Hostal Patria. Casa Botín, founded in 1725, is the oldest restaurant in the world, according to the Guinness Book of World Records, and is a model of traditional cuisine in Madrid. It specializes in roast suckling pig and roast lamb. 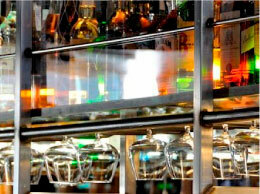 This famous Madrid restaurant is located on Calle Cava Baja. Founded by Lucio Blázquez, popularly known as Lucio, it opened in 1974 and specializes in certain aspects of 19th century Castillian cuisine. Casa Lucio is famous for its “huevos estrellados”, fried eggs served broken up over fried potatoes. 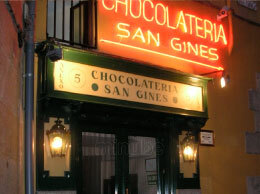 This is one of the most famous hot chocolate shops in Madrid. 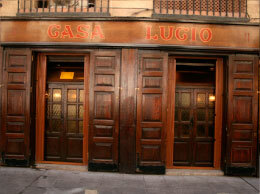 Founded in 1894 and located in the San Ginés passageway (Pasadizo de San Ginés). It is a very popular place to have hot chocolate and “churros”, rings of freshly-fried pastry dough, made for dipping in the thick hot chocolate. 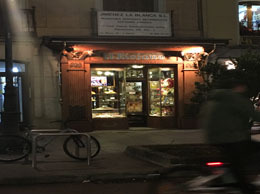 This famous Madrid cakeshop is located on street Mayor 10. Founded by Damaso Maza in 1855.